In 2002 I worked with contractors (construction, acoustical and wiring) to build the recording studios where I would work for the next 9 years. The line drawings indicate two control rooms with two iso booths and a machine room. The isolation booths both looked into the big control room, but the second iso room could also be curtained off for use with the smaller control room. This gave us some flexibility for booking larger sessions in the big room or two recording sessions at a time using the whole floor plan. Since the machine room was attached to the larger Studio A, we used vented, noise reduction cabinets to minimize fan noise in Studio B. The biggest disappointment with this floor plan was all of the space we lost to the handicap ramps. Framing is always one of the first things to go up, but some electrical work started fairly early down the hall from the studio. A dedicated power transformer was installed. You can see the damping pads placed underneath to reduce vibration. Out studio was on the eighth floor, so this particular noise reduction benefited everyone, not just the recording studio. 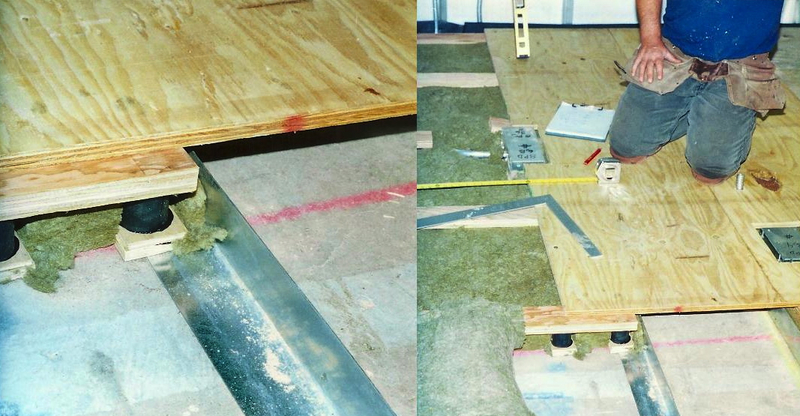 The raised floor was decoupled from the building structure using neoprene pucks. I set my car keys next to one for some sense of scale. It took a lot of them to float the entire floor. The weight of the wood above compressed the pucks significantly. The result was a springy floor, especially in the middle of the room, but it wouldn’t make you seasick just walking around. You can also see how mineral wool was used to fill in the air cavities to help prevent the floor from resonating like a drum. To the right there is no wool in the floor channel created for cable runs. 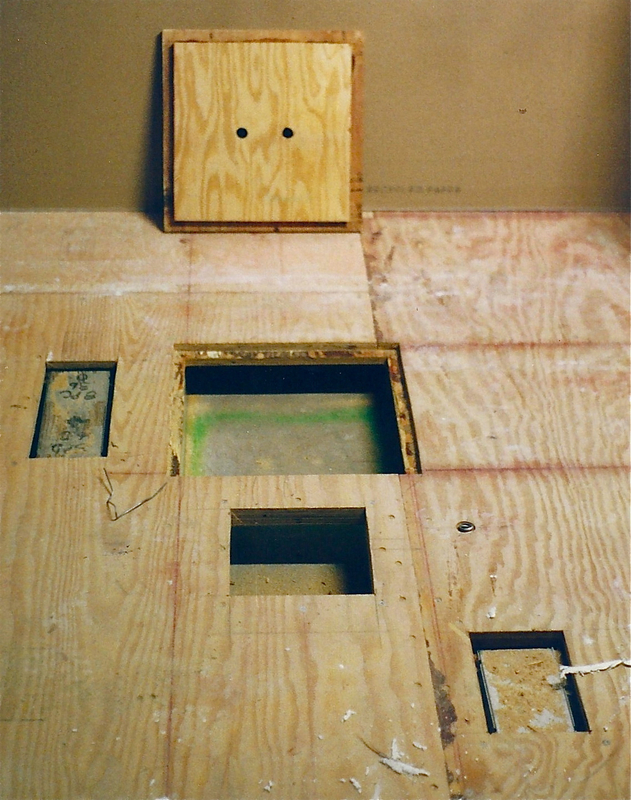 Ports with covers were made at key locations to allow access down to the sub-floor channels. Other panels and boxes were installed for power, ethernet, etc. Keeping the studio cold without making a lot of noise is difficult to do well. 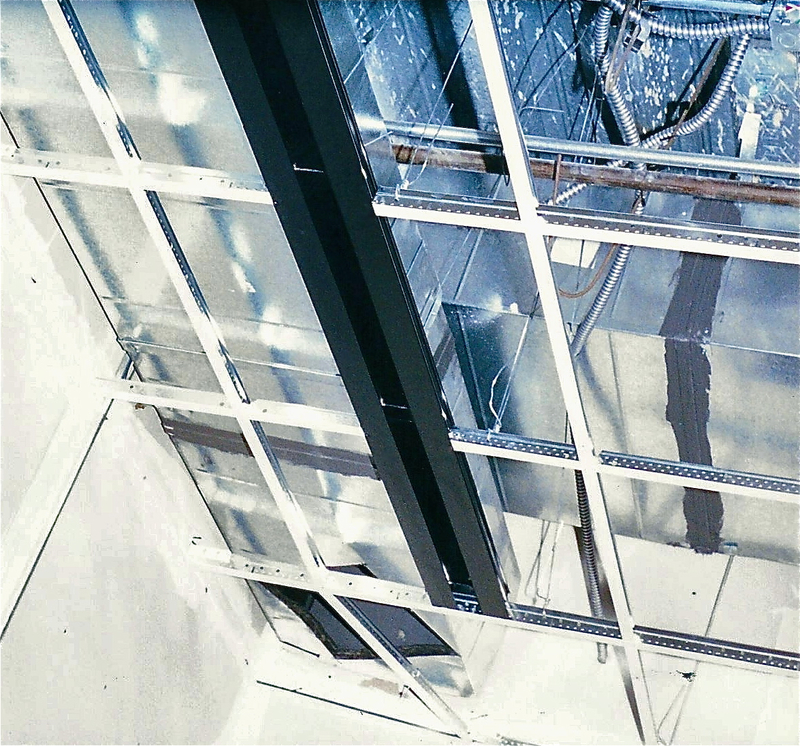 For this facility we decided to draw air off of the floor into the cooling units then let it drop back in from overhead. The delivery of cold air into the room can be quiet if you move a lot of air very slowly. 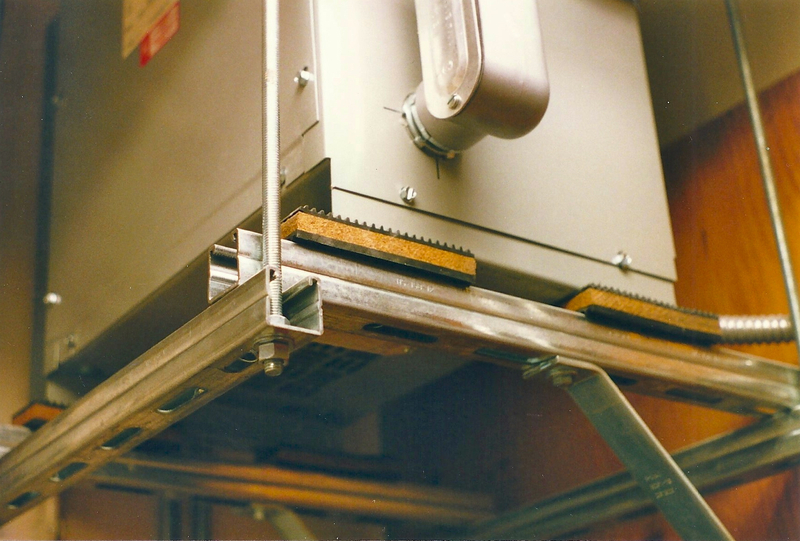 This slat diffusor allowed us to pour cold air down at a high volume and low velocity. Unfortunately, if you sat directly beneath it you often needed sleeves because this system chilled the room very quickly. In my experience building and working in recording studios, keeping the air quiet and comfortable is the most difficult and costly part of construction.